Here at Arron Services we are able to provide a host of different types of computers from the very small Netbooks, all the way up to Server solutions for businesses. 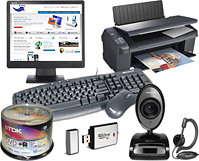 We are also able to offer a One Stop Shop for all your Computer accessories, from Connectors and Cables to a full range of Hewlett Packard Printers. Here at Arron Services we are able to provide a host of different types of computers from the very small Netbooks, all the way up to Servers for businesses. All Desktop PC’s & Business Servers are custom built to the customer’s specification, and can be tweaked for particular circumstances on request. Laptops & Netbooks supplied are from Samsung or HP; however we can provide any make upon request. All Netbooks, Laptops & Desktop PC’s come with 12 Months Norton Internet Security Software, setup at home or business, setup of Internet and email including data transfer to the new computer. 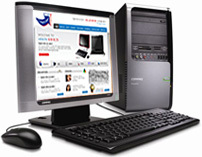 Here at Arron Services Ltd we can provide desktop computers, laptop computers, servers and accessories. All desktop PCs and business servers supplied by Arron Services Ltd are custom built to your specification and all netbooks, laptops and desktop PCs come with 12 months Norton Internet Security Software. To help us improve our web site and service, we would welcome any comments that you may have. (Good or Bad)! We appreciate you taking time to contact us and give us your feedback, it is really important to us.